“Madame X’s aura, after John Singer Sargent,” Anna von Mertens, 2009, hand-dyed, hand-stitched cotton. The show that is on view at the Elizabeth Leach Gallery until February 12th is composed of a series of portraits hand stitched and dyed in a range of strikingly vivid hues by Von Mertens. The images are figurative, although you have to look closely to realize it, and what is represented are not individual subjects in the traditional sense but rather twice-removed, subjective (arguably) reinterpretations of familiar paintings. The composition and scale of each piece is derived from the original. 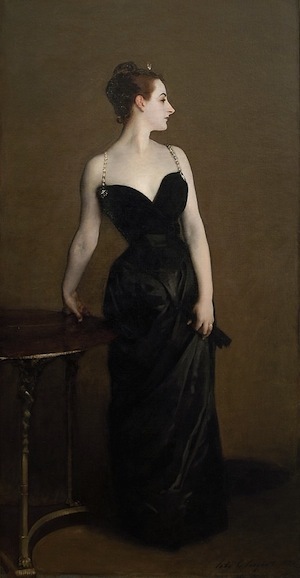 For example, Sargent’s Madame X is present in all of her aloof glory at 83”x 43 ¼. However, instead of impossibly translucent skin and folds of ornate fabric, what is represented is Madame X’s aura in electric red, yellow, and magenta. Now, I know nothing about the science of the aura that Von Mertens may have studied in preparation for making these images. Von Mertens does not offer any kind of key to understanding what the colors chosen signify in relation to the sitter, and although Von Mertens claims that she is attempting a genuine representation of the subject’s personality through the use of this visual language of color associated with various kinds of energy, I can’t help but think it doesn’t matter. Neither do the particular images she has chosen to recreate other than signifying shared visual and art historical knowledge. What makes these images interesting has very little to do with what the electric red halo tells us about Madame X as an individual or about the relationship she had with Sargent, although I do find it important and interesting that Von Mertens does try to assert the importance of these relationships to the work, in a sense trying to imbue her pieces with meaning from the original history or narrative. “Madame X,” John Singer Sargent, 1884, Metropolitan Museum, New York, Oil on canvas, 82 1/8 x 43 1/4. So then, what do these images have to say, and what about Von Mertens’s passing reference to Walter Benjamin’s concept of the aura? In a very straightforward sense they can be seen as an exploration of the relationship between unique works of art and their reproductions or reproduction as the work of art and the kinds of knowledge gleaned from those differences. Benjamin’s concept of the aura was based on technological reproduction while Mertens very purposefully manually handcrafts each piece. Additionally, while, as Walter Benjamin expresses, “It might be stated that as a general formula that the technology of reproduction detaches the reproduced object from the sphere of tradition,” Von Mertens seems to be testing two elements that are essential to Benjamin’s discussion. First, the difference, if any, that technological reproduction has now from manual reproduction when the manual reproduction occurs in the presence of so many technological reproductions. Second, the separation from the history of an Artwork as an object by the very nature of its being a reproduction. Rather than jeopardizing the authority gained through tradition, which is what Benjamin claims for the nature of technological reproduction, Von Mertens makes handcrafted objects that count on and still gain authority (or actively attempt to) from our previous knowledge of technological reproductions of the source images referencing a new tradition based on reproductions. So, perhaps, some semblance of the aura still exists, and if so, is Von Mertens asserting that maybe it should? To get back to the images for a minute, the source images that Von Mertens has chosen do not seem to follow any essential logic. In addition to John Singer Sargent’s Madame X represented are Battista Sforza and Federico da Montefeltro’s auras, after Piero della Francesca and Marilyn Monroe’s aura after Andy Warhol. The choices read like a review of lower-division art history surveys, something titled “Art of the Ages: from Early Renaissance to Pop and Beyond” (and the textbook would probably be published by Thames and Hudson). This is smart of Von Mertens considering the amount of abstraction applied to the images. It is necessary for the titles to be recognizable and to immediately conjure the source material for the reinterpretations to be effective in referencing previous reproductions. Without the titles and the hand stitching the pictures could be mistaken for particularly luminous and blended stain-paintings maybe with a nod to Frankenthaler. Each piece, as mentioned before, is hand-dyed and to correspond to the sitter’s aura while the outline is hand stitched over the biomorphic forms of color. Some of the outlines are more involved than others down to details such as the precise angle of Federico da Montefeltro’s disfigured nose. Von Mertens is visually and conceptually referencing the New Age belief in the aura. Is there anything to this reference other than a parody play or words? Von Mertens says yes. I say yes as well but perhaps for different reasons. 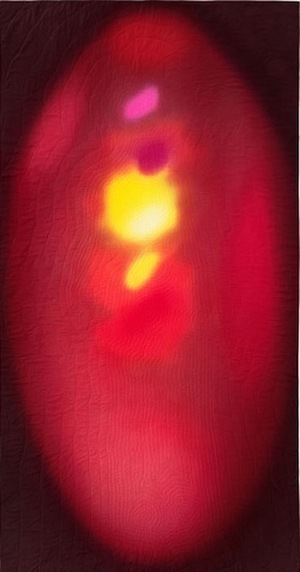 While Von Mertens asserts the presence of personal belief and sincerity in her study of the aura, I think that her use of this method is more interesting when looked at in relation to, again, Benjamin’s analysis of the decline of ritual in art and the rise of politics in its place in relation to the use value versus exhibition value. These intricately handcrafted images are relying on a system that is anchored in spirituality, not material origins. They are trying to assert a belief system over images that have had, to a certain degree, been stripped of their aura as unique works of art through their endless reproduction. While Von Mertens interest in this field of knowledge seems to be in contradiction to Benjamin’s materialism, the work could also be seen as being in conversation with Benjamin’s ideas, not a rejection, not a prescription or rather perhaps a rejection as well as a prescription. Originally published on February 6, 2011 at Ultrapdx.com. Direct URL: http://www.ultrapdx.com/zero/2011/02/06/review-anna-von-mertens/.